Do You Doubt Your Security with Christ? 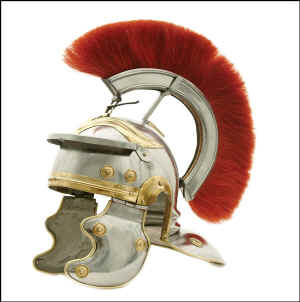 In Paul’s day everyone was familiar with the armor used by a Roman soldier. One vital piece of a Roman soldier’s armor was his helmet which was specially designed to deflect lethal blows to the head. Likewise, it’s true for the Christian soldier in spiritual warfare; the helmet of salvation protects us from Satan's severe blows. The believer’s helmet is further described in 1 Thessalonians 5:8 as "the hope of salvation" (our faith). The implication for you is that the most aggressive and violent blows from Satan’s attacks are directed at your assurance of salvation and security in Christ. The message is clear - just as a strike to the unprotected head of a Roman soldier renders him unable to defend himself, the same is true if you doubt your security in Christ - it will render you ineffective in spiritual warfare. If you are doubting assurance that you are secure in Christ, it means you have not put on your helmet, leaving you in great vulnerability of doubting your faith. Recall this very precious promise from Jesus: I will not lose one person of every one He has given Me, but raise them all up at the last day (John 6:39). Through daily prayer, thank God for this promise, recall that you are secure in Christ, and experience again the joy of your salvation so that you may stand in the battle.